Ace Frehley Burst. You may notice that Ace sounds thicker than the Riot burst. Back in 1986 when Vic Dapra had every 59 Les Paul imaginable, I asked him which one was his best sounding burst? Vic replied to me the Ace Frehley burst. I feel bad for anyone who purchased the remake of this Ace burst guitar because Gibson has told my attorney that they did not use the scans of my Ace burst when they made the remakes and in fact it was based upon Ace's memory of the guitar and photographs. To make a long story short anybody who purchased the remake of the Ace Frehley 59 Les Paul was robbed by Gibson. I really think Gibson has set them self up for a class action lawsuit. Considering that Gibson lied to the public in adverts in every way regarding that Ace 59 guitar which is not a duplicate of my guitar! Gibson's attorney said its based upon Ace's memory. Ace has not seen this guitar in 30 years! He relinquished ownership of it in 1986 when he was unable to pay We Buy Guitars the extra 4 thousand dollars that was owed to get the guitar back. The guitar was 6000 dollars in 1986! Ace couldn't get it together. I offered Ace the guitar for 75k in 1991 and he said he was broke. Ace didn't have the cash. Now Ace is very bitter because the guitar is the most valuable Les Paul in existence. Currently valued at 2 million or more. I think its priceless. Its the best guitar on earth and Ive played them all. I had to hire attorneys to sue Gibson. They paid me a small amount than breached the settlement and never gave me the 4 guitars and cash which I was supposed to get in a signed contact I signed. I don't even own a copy of Ace's guitar. They refused to send me the guitars they swore they would give me in my contract. Henry is a serious criminal of the highest order. He destroyed Gibson. Its been a legal nightmare which is still ongoing. Ace ended up making over 300k or more on the deal after it was all said and done. He was given 7 guitars all of which he sold of for over 25k each. Ace refused to give me one penny. Yet Ace gave Matt Swanson money on the Budakon Les paul deal when Swanson let Gibson use his Budakon guitar to duplicate. Again. I feel awful for anyone who was robbed by Gibson. They totally played the public. I will be posting the letter from Gibson's attorney which states that they did not use the scans of the actual Frehley Burst guitar when making the 300 remakes which were seriously overpriced. For anyone who purchased the Ace guitars. Please contact me and I will put you in contact with my attorney about details regarding a possible class action lawsuit. Moral to the story. Hire a lawyer from day one and do not trust Henry at Gibson or VP Rick Gambar, Kevin Van Hammel and those other criminal people at Gibson who were involved in this Ace Frehley 59 burst guitar sham. 15k for an Ace guitar that was not even based upon the original scans? That is not cool and its criminal. It was supposed to be based upon the actual scans and Gibson said it was not. So sad the way Henry does biz and he wonders why the Gibson custom shop went out of business? In time i will tell the whole story of what Gibson did. Flying me out to Nashville saying they had contracts ready. Than I get there and there was no contract. They blamed it on Ace and said don't worry we will give you 4 guitars and cash same as Matt Swanson got on his Ace Budakon deal. It was like a bait and switch shell game. Stupid me trusted Gibson and found out the hard way but in the end truth prevails. The Gibson custom shop that made those fake Ace guitars went out of business, so God is good in the long run. Justice was served.. Sounds like a bitter guy to me. CS is not "out of business" either. Probably 2 sides to this story. because the guitar is the most valuable Les Paul in existence. Currently valued at 2 million or more. 15k for an Ace guitar that was not even based upon the original scans? It's only actionable if Gibson explicitly said that the AF CC was based on scans of the original. Did Gibson make this claim? Considering that Gibson lied to the public in adverts in every way regarding that Ace 59 guitar which is not a duplicate of my guitar! 'Lied' could be libelous unless Gibson made a false claim, eg. that the AF CC was based on scans of the original. Did Gibson make this (or any other) false claim in its marketing of the AF CC? The Gibson custom shop that made those fake Ace guitars went out of business, so God is good in the long run. Justice was served.. The inclusion of counterfactuals like this in AR's comment doesn't inspire confidence in the strength of his position. That may be libelous if Gibson did not make any false claims (eg. based on scans of original) in its marketing of the AF CC. Always drama with these F-ing guitars. Why wouldn't you have mentioned this when the Ace run was introduced? If Gibson did jack Al around ...they shouldn't have....they apparently treated everyone else with respect regarding their bursts....why not AL...? I can't turn up anywhere that Gibson says they scanned the original. Some retailers have that on their sites, but nothing from the big G. It's possible that Gibson let people think they did the scans etc. and never corrected them for saying it, but I can't find anything published by Gibson saying they scanned the 59. Sounds like a big wall of butthurt. I like Al's claim....."Its the best guitar on earth and Ive played them all". Damn dude! How did you find the time!? Sorry for OT, but does Paul actually own two 60 bursts? As far as I know, he was offered a second one at some point in the 90s but didn't buy it. He's had a lefty gold top for quite some time though. I believe Al replied to this post and was not the OP (unless the OP and Big Al are the same person). Ace Frehley Burst. PLEASE SHARE POST!! You may notice that Ace sounds thicker than the Riot burst. Back in 1986 when Vic Dapra had every 59 Les Paul imaginable, I asked him which one was his best sounding burst? Vic replied to me the Ace Frehley burst. I really think Gibson has set them self up for a class action lawsuit. I offered Ace the guitar for 75k in 1991 and he said he was broke. Ace didn't have the cash. Now Ace is very bitter because the guitar is the most valuable Les Paul in existence. Currently valued at 2 million or more. I think its priceless. Its the best guitar on earth and Ive played them all. I had to hire attorneys to sue Gibson. They paid me a small amount than breached the settlement and never gave me the 4 guitars and cash which I was supposed to get in a signed contact I signed. I don't even own a copy of Ace's guitar. They refused to send me the guitars they swore they would give me in my contract. Henry is a serious criminal of the highest order. He destroyed Gibson. Moral to the story. 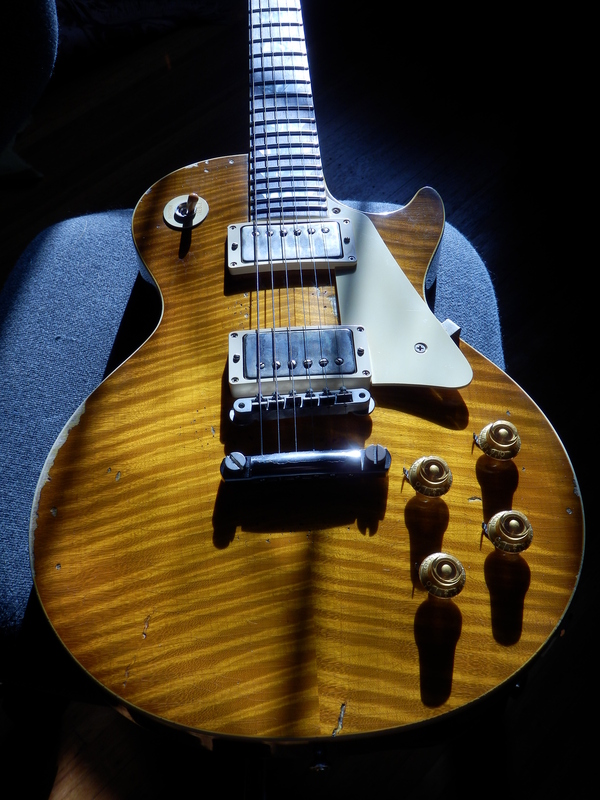 Hire a lawyer from day one and do not trust Henry at Gibson or VP Rick Gambar, Kevin Van Hammel and those other criminal people at Gibson who were involved in this Ace Frehley 59 burst guitar sham. That is not cool and its criminal. It was supposed to be based upon the actual scans and Gibson said it was not. Just a copy to have for future reference . Dumb question , Which year re-issue are you referring to ? I never looked at these much , after the tops . Robbed ??? I'd be thinking about possible slander before I'd post that , but that's just me . Seems like everyone who "bought 1 of those guitars , got the guitar promised , which is on the dealer to provide ,anyway . Unless you bought directly from Gibson. robbery implies a completely different scenario . I wonder how much $$$ was needed to HIRE the lawyer to sue Gibson in the 1st place .... Years after the fact .... Good thing I never cared about the CC / Artist line much . And I knew about the Beano before hand and thought it was a very nice thing that part of the $$$ was being used to Help people. Sort of , (the purchaser) like doing something nice , in a round about way ... While getting Clapton's Sig on a Gibson . Funny(Not really) that values of all Gibson's have tanked .... But what's news about Gibson being deceptive ??? Nothing,,, as it's be happening for years . That's how they work . If you're thinking you'd be getting anything other then a Nice , hopefully well made C/S guitar .... As the vast amount of us have never had a hand on a Real Burst ... Really couldn't know the difference . Anyway , since it was never getting BRW (and other parts never re-made to original build specs), it could never have been a True re-make of a Original LP . Gibson ,,,only selling Dreams with those CC's . of that guitar in the mid Sixties. IMO artist and CC LPs are just a way for Gibson to charge a higher price for a '59 re-issue. They may or may not be better than a regular historic. Every guitar has to be evaluated individually. Just more proof that some people can't let go of the past. You can't relive it, why worry so damned much about it? Why take up so much of your present and future being pissed about something so effing trivial? I don't get it. I didn't buy my reissues because I'm trying to recreate the past. I bought them because they are the best sounding "present" offerings in the LP format from Gibson. If the Standard was best, I'd be owning those. I thought it was a great run. Not sure about his choice of footwear, but he has the licks down pat.